Do you battle with the removal of stubborn spots, water streaks and dust build-ups from your windows? Do they cost you too much energy and you don't want to engage in this household task? This task will no longer consume a lot of your time and efforts! The experts of window cleaning in South Woodford are willing to give you a hand! You will be able to use your spare time as you like – the trained and trustworthy team members will manage the sweeping and polishing. We deliver impeccable cleaning services for all kinds of glass surfaces. Read on and learn more about the different advantages you can have. We also provide our professional services in nearby areas: Manor Park, Little Ilford, Aldersbrook, Petersham, Richmond. You can be sure that the gleaming look of your office building is guaranteed. The experts will provide you with top-notch commercial window cleaning. With our water-fed extension pole system, you will witness swift and splendid cleaning of all windows up to the fourth floor. For high-rise buildings, we put to use our rope access equipment. It is our efficient technique of reaching glass panes on taller edifices. It doesn't matter what is the size of your property – a humble corner shop or Heron Tower – we will leave a perfect look of your windows. We are glad to use the latest strategy to ensure that you get the best window cleaning. The glass surfaces of your building are going to look spotless after we use water-fed extension pole cleaning system and high pressure cleaning on them. We use our vans to supply the poles with water and we can reach as high as the fourth floor. In case you request cleaning of windows on taller buildings than that, we have rope access window cleaners available. Call us on 020 3746 3113 and get in touch with us – these efficient procedures will bring you results right away. You can depend on the team - they are truly the experts of window cleaning. They all have passed through complex training sessions, so you can receive second-to-none service for all window kinds. What we can clean includes: single, double, sash or bay windows, garden windows, French doors, patio doors, greenhouses and roof windows. Your house can become better swiftly with our assistance. Call us every time you need professional window cleaning for your house or business. 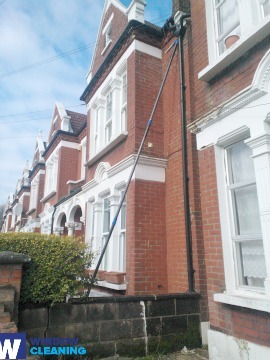 Profit from our quick and dependable domestic window cleaning in South Woodford. We can clean the windows of your house inside and out. The products we use are environmentally friendly - you will love the great results and make a green choice. Furthermore, we use only purified water. Don't delay, dial 020 3746 3113 and order our first-rate services. Our customer care staff will assist you – they are active 24/7. Another ways of booking – our request a cleaner online form or just chat with our customer care assistants.